Save 10% today... This beautiful vaseline and cobalt wine stem is quite eye-catching. The goblet size bowl features an incredibly vibrant vaseline color with hints of green. It is blown, rib optic glass with subtle curves extending to the cut and finished rim. 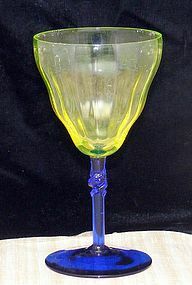 The stem is a deep, royal cobalt blue with a twist, attached to the blown and finished foot, and the yellow bowls. It stands 6 1/4" tall is in excellent, unused condition. I have searched to find the maker, but no luck so far. If you do know, I would certainly appreciate an e-mail. Insurance and confirmation is included in the price.